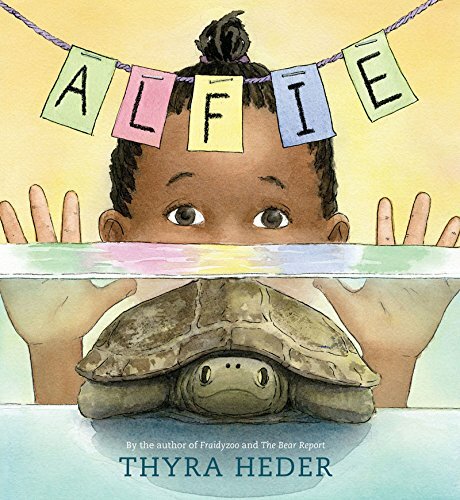 Alfie: (The Turtle that Disappeared) is the third picture book written and illustrated by Thyra Heder and it is every bit as enchantingly charming, happily domestic and intimately detailed as Fraidyzoo and The Bear Report. But, I must confess that, as the owner of four three-toed-box-turtles, two of whom "escaped" to be found a few weeks later in the backyard some thirteen years ago, I had to take a few deep breaths as I read Alfie: (The Turtle that Disappeared). That said, I am the adult caretaker of these reptiles. 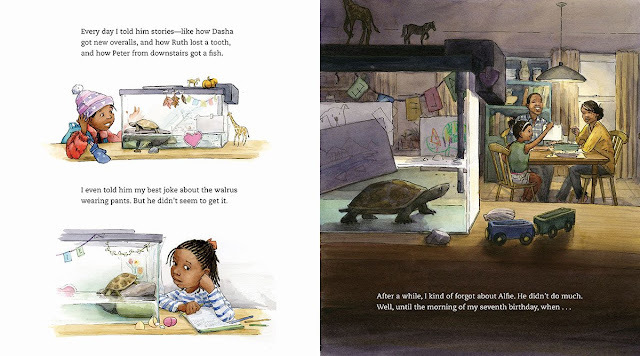 I have no doubt that kids listening to or reading Alfie: (The Turtle that Disappeared) will fall in love immediately with this story of a girl and her turtle. 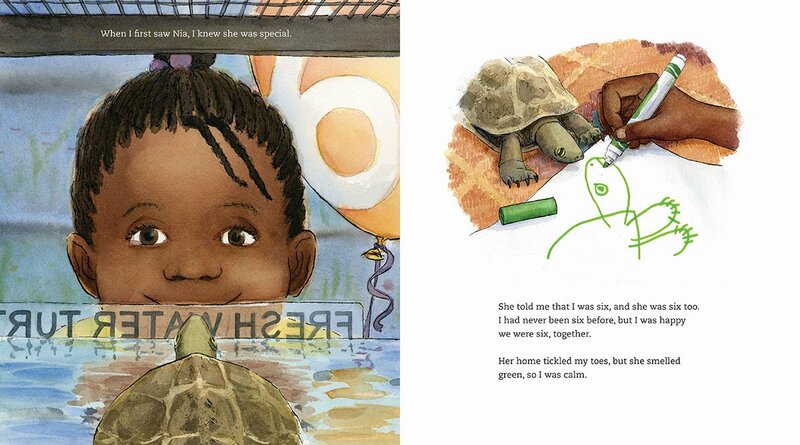 Or is it a story of a turtle and his girl? 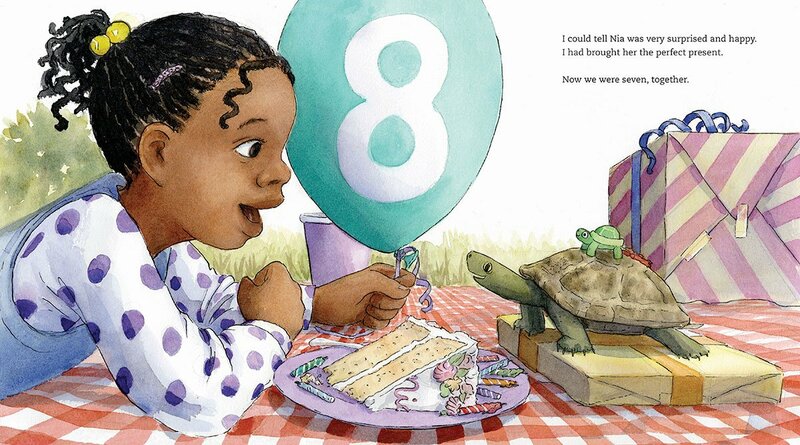 Nia narrates this story that begins on her sixth birthday when she gets Alfie, a turtle who is probably also six. Nia talks to Alfie all the time, telling him stories about her day at school, teaching him dances, introducing him to all her toys and even making decorations for his tank and leaving him presents. When Alfie doesn't respond, Nia loses interest, absorbed with plans for her seventh birthday. Then Alfie disappears. A two-page illustration of Alfie's empty tank is followed by a change in narrators. Now Alfie is telling the story of the first day he met Nia, all the wonderful things she does for him and his wish to, "make her as happy as she made me?" Alfie's search, throughout the house, including a hilarious exchange with Toby, the dog, leads him outside. Sad, cold and tired, Alfie settles down for a nap in a pond in the backyard. Waking in the spring, Alfie finds just the right present for Nia and delivers it just in time . . . for her eighth birthday! Alfie: (The Turtle that Disappeared) ends with an Author's Note about her own Alfie, which she received on her sixth birthday. 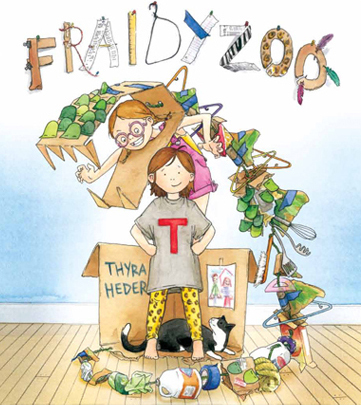 Like Nia, Thyra lost interest in her pet. 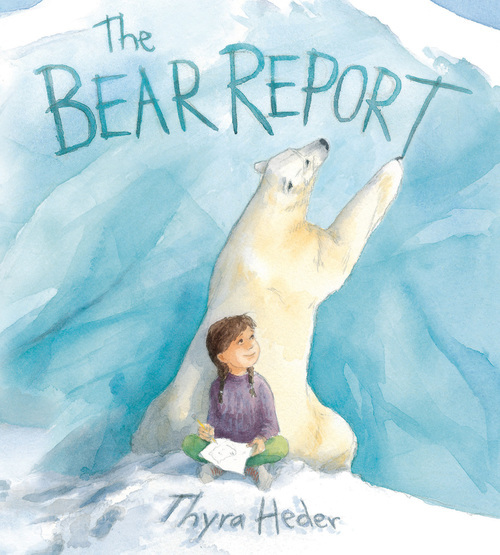 But, some twenty years later, she discovered that the, "lucky thing about turtles is their lifespan is long enough for you to all back in love with them." Heder fell back in love with Alfie watching him wander around her childhood home, sticking his head into slippers and scratching his back on the radiator. Alfie is a story about love - the love of a pet owner for her pet that stops being new and exciting - and the love of a pet for his owner.